Contact details (phone and e-mail) to book or join Rawdon's Regiment. Educational visits and event commentary. The dates of battles and other official regimental events (such as our famous torchlight procession). Plus links to other websites that may be of interest. Would you like to book Sir Marmaduke Rawdon's Regiment for a carnival, fete, corporate, historical or special event? Our regiment is currently over 170 members strong and is spread across England & Wales, with our "core" in Hampshire, Sussex, Devon, Oxfordshire and Wiltshire. We are happy to travel and can aim to tailor numbers to suit your needs and space accordingly. We are highly experienced in the broad spectrum of event types, from parades, through to small arena and drill displays, right up to hosting larger battles. As one of the oldest founding regiments of the Sealed Knot, we can confidently offer a wide variety of points of interest. 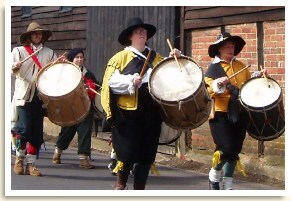 This can include displays of 17th Century pike, musket, drums and colours, with both officers and "rank & file", with ladies and "baggage" (camp followers), with cannon and perhaps even some cavalry! We can also provide an authentic soldiers' encampment, which is a great focal point before and after the drill displays have been demonstrated! We always encourage audience participation and engagement immediately after our displays too. This is a fantastic opportunity for both kids and big kids alike to try on armour and handle a pike, or to just wander through the living history encampment and ask questions; all of which audiences enjoy and which keeps them engaged. For information on availability and booking fees, please contact either our Commanding Officer (Tosh) or our Public Relations Officer (Chris). e: chrisburfitt@uk2.net or on p: 01691 718-879. Integral to what we can offer at any event is a very experienced and knowledgable Commentator, Mike "Spanner" Betteridge, the previous Regimental Commanding Officer. With the use of a PA system, Mike can guide, entertain and educate your audience through the scenes played out before them; whilst we provide the visual (and audible) spectacle. 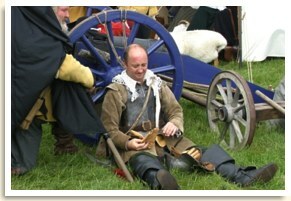 He is also in regular demand by other regiments across the Sealed Knot for their events throughout the year. 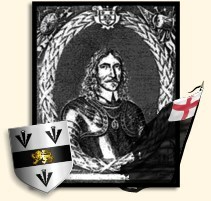 Spanner is also regularly booked as a guest speaker by Schools, Colleges, Social groups and other organisations, to provide very knowledgable talks about the history of the period and the military aspects of the English Civil War. Richard Dace is an ex-Rawdon who has done extensive research into Sir Marmaduke Rawdon.